NSD absolute position sensor named ABSOCODER is an electro-mechanical sensor that measures the angular position or linear travel length under magnetic reluctance change. ABSOCODER's outstanding durability with field proven performance is achieved by a creative construction of the design which eliminates mechanical contact and satisfies zero-electronics inside sensor. The output of ABSOCODER indicates always the current position of the mechanical site even under power fail and/or cable disconnection. ABSOCODER measures and indicates always the current (absolute) position even though power is removed from the system, and the position of the ABSOCODER is available immediately on applying power. The relationship between the ABSOCODER value and the physical position of the controlled machinery is set assembly, the system does not need to return to a calibration or zero position to maintain position accuracy. Even ABSOCODER has no any memory devices or battery to maintain the position. ABSOCODER is an electro-mechanical position sensor that measures the physical position under magnetic reluctance change. ABSOCODER is true heavy-duty position sensor which is extremely robust without any electronics and optical items inside sensor, very durable under high temperature / high shock / high vibration / under water, and absolutely reliable with fail-safe. 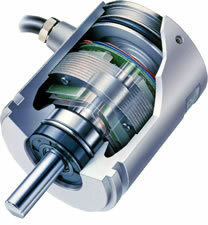 ABSOCODER is always required to connect with NSD dedicated converter (transducer) which electrically converters the mechanical movement to upper control system. "The principle is based on this single-turn type ABSOCODER. As shown in the ABSOCODER operating principle diagram, a coil of wire is wound around each of the four stator poles, to which ""a sin ωt"" and ""a cos ωt"" inputs are supplied. When the rotor, eccentric to the stator poles, is turned θ degrees, a four-pole-aggregate output of ""k sin (ωt-θ)"" will be induced, and the rotation degree θ can be calculated from the ""a sin ωt"" input and the ""k sin (ωt-θ)"" output. The calculated θ will be output as an absolute value. " The basis of the linear-type ABSOCODER (VLS) principle is the same as the single-type ABSOCODER (VRE). The length uivalent to one- rotation of VRE is the same as the length of one-pitch of VLS. As shown in the rod sensor operating principle diagram, the rod comprises a series of magnetic and non-magnetic materials arranged in a straight line and alternating at an identical pitch. Primary and secondary coils are wound concentrically to this rod, with "a sin ωt" and "a cos ωt" inputs supplied to the primary coil. The position of the rod length is output by counting pitches at a converter or controller when the travel length is more than one-pitch. The semi-absolute is a method that the converter counts pitches and outputs the value.